The Film Development Council of the Philippines, in partnership with SM Entertainment will launch Cine Lokal on April 19, 2017 with President Rodrigo Roa Duterte as the Guest of Honor. The event will be held at the SM Mall of Asia in Pasay City. The Philippine premiere of Director Mel Chionglo's award-winning film, Iadya Mo Kami, will follow the program, simultaneous with the screening of Academy Award Best Picture for 2015, Spotlight. Cine Lokal is a partnership between the Film Development Council of the Philippines which dedicates eight (8) commercial theatres for the exclusive screening of FDCP-curated independent and award-winning films. The launch will be the first film-related event that the President is attending since he assumed office in July 2016. "We are beyond honored and grateful for this show of support by no less than our President," said FDCP Chairperson and CEO Liza Dino. "This reaffirms the government's support to the development of the Philippine cinema. We are confident that Cine Lokal is just the start of the government and the film industry coming together to further cultivate a culture of film appreciation that goes beyond entertainment value. This is in line with the President’s vision of using culture and arts as key elements in nation-building, as film is a powerful medium that can instill the concept of culture and identity among Filipinos," she added. FDCP will be programming content every month with a running theme to further encourage discourse among the audience. 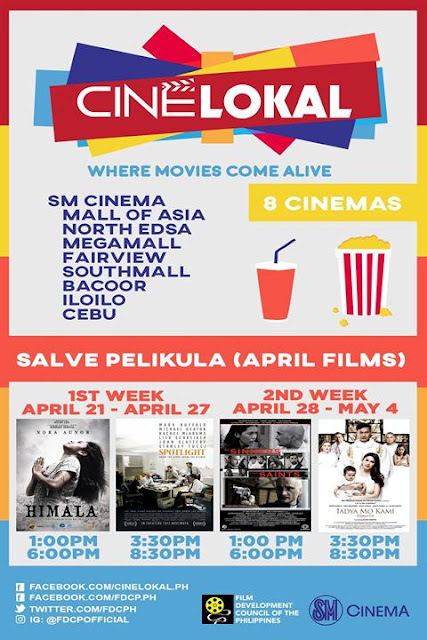 For April, films for Salve Pelikula will be screened, including the following titles: Spotlight, Himala, Iadya Mo Kami, and Of Sinners and Saints. Salve Pelikula will showcase these films that focus on faith, religion, and humanity. Salve Pelikula will run starting April 21, 2017 in Cine Lokal theaters.